Order the core materials your commercial project requires with our range of industrial supplies. We stock a wide range of tubes, valves, and fittings, from a number of leading industry brands. With more than 60,000 items in stock, we're sure you'll find the tools you need to complete your construction work with ease. Call 01474 334401 for all your industrial supply needs. Receive all the materials you require with our range of merchant services. 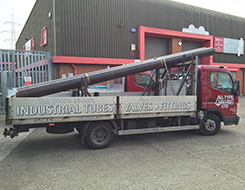 At All Type Valves Ltd based in Northfleet, Kent, we specialise in providing high-quality industrial supplies for various commercial projects. Backed by more than five years in business, our family-run company offer a variety of products, including; tubes, valves, and fittings, to a number of aggregate industries. With our wealth of product knowledge and years of experience, national companies have said our service is friendly and second-to-none.